Horse Riding Trails in Texas are a plentiful. What else would you expect from the Lone Star State? Horse back riding runs deep in our history. Regardless of what Texan stereotypes have led outsiders to believe, not every Texan is fortunate enough to be skilled at horse riding. However, for those of us who are, there are plenty of places where you can take your own horse, or rent one, to ride on picturesque trails. Here are 10 horse riding trails in Texas that every equestrian enthusiast should try. There's a 3.5 mile riding trail and an equestrian campsite at Copper Breaks State Park. It's also a great place to stargaze since it has been designated an international dark sky park. There are 13 miles of trails in Brazos Bend State Park that can be used for horse riding. The park also offers primitive equestrian campsites for those who would prefer to camp out with the horses. All the trails in Caprock Canyons State Park and Trailway are multi-use (including equestrian) unless otherwise indicated. Some trails can be difficult though, be sure to check the difficulty level of the trail before heading out. There are 20 equestrian campsites at Lake Mineral Wells State Park and Trailway. Make a reservation though if you want to be certain of a spot. There are 12 miles of multi-use trails for horseback riders. If you haven't already, you've got to go ride at Palo Duro Canyon State Park. The park houses a 1,500 acre equestrian area where horses may be ridden. There are trails and primitive campsites, and for those who don't own their own horses, you can rent one and go on a horseback tour by contacting Old West Stables. At Pedernales Falls State Park, the trails are rocky and the terrain can be challenging. However, the park offers an equestrian group camp for up to 12 people for only $40 per night. The campsite has six horse pens and well water available for the horses. There is a 100 acre area preserved for equestrian use at Dinosaur Valley State Park. The trails are unmarked, making this ride a bit more challenging. The 10 mile trail that runs along the perimeter of the state historic site of Fort Richardson will make you feel like you're riding in the old west. The park contains several original buildings from the fort that have been restored. 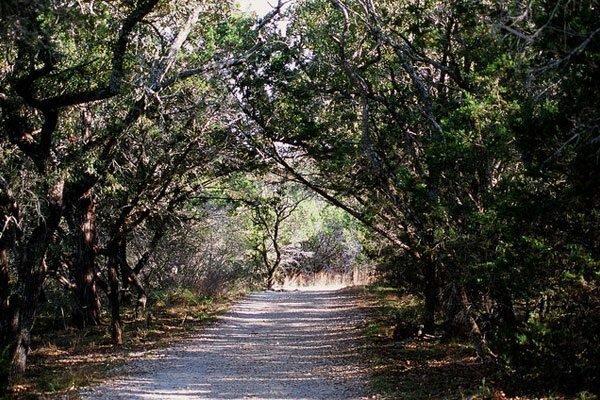 There are several equestrian trails that run through Guadalupe River State Park. The park that accompanies Texas's favorite floating river contains some of the most beautiful horse riding trails in Texas. Consult the trail map to find out where horses are allowed. West Texas is a prime location for horse riding trails in Texas. For equestrians wanting to ride in the Davis Mountains, the Davis Mountains State Park offers 7 miles of trails as well as equestrian campsites. The trails afford beautiful views as well, since they run from 4,900 ft. to 5,700 ft. elevation.